The Consumer Protection (Fair Trading) Act (Cap. 52A) or CPFTA was enacted to protect consumers against unfair practices and to give them additional rights in respect of goods that do not conform to contract. It is the result of years of advocacy by the Consumers Association of Singapore (CASE) because of our firm belief that we need a fair trading legislation to promote a fairer and more equitable marketplace. Such legislation would protect both consumers and businesses by making the playing field more level. In 1979, the late Mr Ivan Baptist, then President of CASE, first urged the government to consider a fair trading legislation in Parliament. After several years of study on the feasibility of a fair trading legislation for Singapore, the CPFTA was finally passed in Parliament on 11 November 2003 and took effect on 1 March 2004. Through the years, CASE has worked closely with the Ministry of Trade and Industry to periodically revise and update the CPFTA to ensure that it remains relevant. Enforcing compliance with injunction orders issued by the Courts. With effect from 1 April 2018, the Competition and Consumer Commission of Singapore (CCCS) took over the administration of the CPFTA. CASE and the Singapore Tourism Board remain the first points of contact for local consumers and tourists respectively to handle complaints. Errant suppliers who persist in unfair trade practices will be referred to CCCS for investigation. While the CPFTA gives consumers the right to seek recourse, consumers should still be vigilant in protecting their own interests by exercising due care when buying goods and services. More information on the subsidiary regulations can be found here. The Lemon Law took effect on 1 September 2012. It is a law that protects consumers against goods that do not conform to contract or are not of satisfactory quality or performance standards at the time of delivery. Under the Lemon Law, businesses are obligated to repair, replace, reduce the price or provide a refund for a defective good. 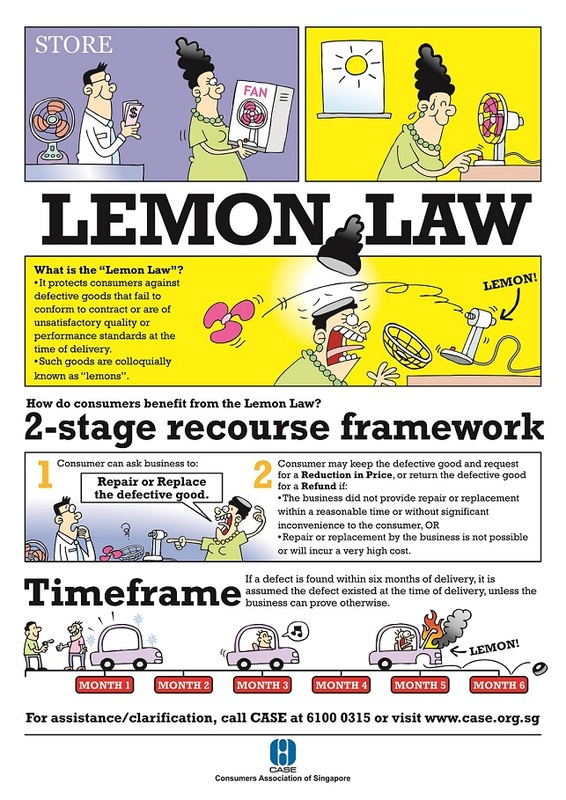 The provisions of the Lemon Law can be found in Sections 12A to 12F of the CPFTA. The Lemon Law covers all general consumer products purchased in Singapore (e.g. apparel, stationery, electronics, furniture, motorcars, etc). It does not apply to houses, land or rental/leased goods. Second-hand goods and vehicles are included but "satisfactory quality" would take into account their age at the time of delivery and the price paid. The Lemon Law does not apply to services. It does not apply to business-to-business and consumer-to-consumer transactions. The consumer had damaged the item. The consumer had misused the item and caused the fault. The consumer had tried to repair the item himself or had someone else try to repair it, and in the process damaged it. The consumer had been told about the fault before he bought the item. The consumer had changed his mind and no longer wanted the item. The fault is due to wear and tear. For more information on the CPFTA and the Lemon Law, you can purchase the Fair Trading & You Booklet from our CASE office for $3.21 (including GST).